Neptune is a planet. Is Pluto? Neptune image by Voyager 2. Pluto image by Hubble Space Telescope. A newfound pair of extrasolar planets may boost the planetary prospects of beleaguered Pluto. The pair has the same orbital resonance as Neptune and Pluto, and the "inner" planet may sometimes lie beyond the "outer" planet--the same situation that prevails for Neptune and Pluto. Indeed, it was Pluto's failure to clear its orbital zone of other material--for example, of Neptune--that caused the International Astronomical Union (IAU) to demote Pluto in 2006, a decision that has created an enormous ongoing controversy. Now Alexandre Correia of the University of Aveiro in Portugal and his colleagues have discovered two giant planets whose orbits sometimes touch and may even overlap. And the similarity with Neptune and Pluto doesn't end there. Both planets are in a 3:2 resonance: the inner planet completes three orbits around its star in the same time that the outer planet takes to complete two orbits. The planets revolve around an orange dwarf star named HD 45364. This star is somewhat fainter and cooler than the Sun. It is about 110 light-years from Earth in Canis Major, the constellation that hosts the brilliant star Sirius. The planets' gravity perturbs HD 45364's line-of-sight velocity, which allowed the astronomers to detect the new worlds. 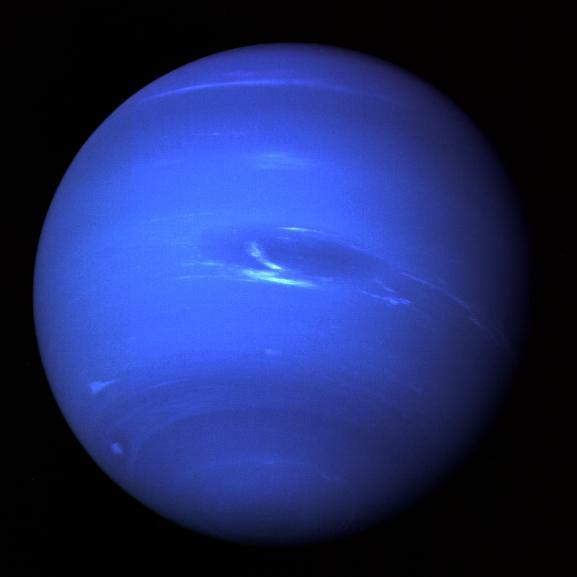 The inner planet has at least 3.5 times the mass of Neptune but on average is about as far from its star as Venus is from the Sun. The outer planet is more massive--it has at least 2.2 times the mass of Saturn--and is slightly closer to its star than the Earth is to the Sun. Unlike Venus and Earth, which have fairly circular orbits, the two planets of HD 45364 have rather elliptical orbits. As a result, at its farthest, the inner planet is 80 percent of an astronomical unit from its star, just shy of the outer planet's minimum distance from the star of 81 percent of an astronomical unit. One astronomical unit is the mean Sun-Earth distance--92,955,807 miles. Furthermore, as the gravity of one planet tugs on the other, the ellipticities of their orbits wax and wane. When the planets pursue their most elliptical paths, they can be the same distance from their star, as Neptune and Pluto sometimes are. If the planets are massive enough, they even interchange positions, as Neptune and Pluto also do. From 1979 to 1999, Pluto was closer to the Sun than Neptune was. The precise behavior of the extrasolar planets depends on their mass, because the more mass they have, the more they alter each other's course. If the two planets have the minimum possible mass, then in 65 years, Correia calculates, the planets' orbits will touch each other: the inner planet's maximum distance from its star will equal the outer planet's minimum distance, 83 percent of an astronomical unit. If the planets have twice the minimum mass, then in just 20 years their orbits will overlap, as Neptune's and Pluto's do, with the "inner" planet sometimes lying farther from its star than the "outer" one does. However, Correia and his colleagues say the two extrasolar planets will not collide--for the same reason Neptune never hits Pluto: the 3:2 resonance protects them. Whenever Neptune and Pluto are the same distance from the Sun, the two worlds are far apart. Correia's team calculates that the planets of HD 45364 never come closer together than 0.37 astronomical units, or 34 million miles. Venus comes closer than that to Earth. Like Neptune, and unlike Pluto, both of HD 45364's planets are giants. Yet neither planet has cleared its orbital zone of the other. Thus, some might argue these objects are not really planets--even though they're larger than Earth. Conversely, others might argue these objects are so large they must be planets and thus illustrate the absurdity of the IAU's planet definition, which requires that a planet clear its orbital zone, something Pluto has failed to do. But Correia notes a difference. "Neptune does not `see' Pluto gravitationally," he says. "The influence of Pluto on Neptune is really very small, but the influence of Neptune on Pluto is very high. In the case of HD 45364, the gravitational interactions between the two planets are important--from one planet to the other and vice versa." Only one other extrasolar planetary system is known with a 3:2 resonance. This resonance involves the two planets discovered in 1991 around PSR B1257+12, a pulsar in Virgo. However, like Venus and Earth, the pulsar planets have fairly circular orbits, so their paths never overlap and their positions never interchange. Two other stars--HD 82943 in Hydra and HD 128311 in Boötes--have pairs of planets whose orbits overlap. (You can download a simulation of the HD 128311 system here, courtesy of Gregory Laughlin at the University of California at Santa Cruz.) However, in both these systems, the planets are in a 2:1 resonance, with the outer planet taking twice as long as the inner to complete an orbit. This resonance differs from the 3:2 resonance that characterizes Neptune and Pluto as well as the planets of HD 45364. Because HD 45364's planets are close to their star, they are much warmer than frigid Neptune and Pluto. In fact, both extrasolar planets could have pleasant temperatures. "If you have a moon around one of these planets, you could have water in a liquid state," says Correia. But the Earth's Moon is also the right distance from its star to have a mild climate. "And you do not have life on the Moon," he notes. The astronomers will publish their work in Astronomy and Astrophysics. Ken Croswell is an astronomer and the author of Planet Quest, a book about extrasolar planets, and Ten Worlds, a book about the solar system. "An excellent introduction to a branch of astronomy that may eventually help to establish the presence or absence of life elsewhere in the universe." --New York Times Book Review. See all reviews of Planet Quest here.